Robert Costa and Steve Fainaru are our guests this week. Original Air Date: October 12, 2013 on SiriusXM “POTUS” Channel 124. This is one of those weeks where, if you don’t keep your eyes constantly on cable news or on Bob Costa’s twitter feed, you’re bound to miss the latest development in the shutdown showdown: President Obama in the briefing room; Speaker Boehner in the Radio/TV Galler; Paul Ryan in the editorial pages of the Wall Street Journal; Harry Reid on the Capitol Steps; Tom Coburn, scissors in hand, in the well of the Senate. Makes you almost pine for Ted Cruz reading Green Eggs and Ham. I, for one, am confused, and I’m surely not alone. Shutdowns, if they have to happen, should have consequences, but it seems like many unpleasant realities have been sidestepped, from death benefits for families of the fallen to promises for back pay for those furloughed. So we as taxpayers are on the hook for a lot of impromptu vacation days. It seems that Congress is intent only on keeping the EPA off the job. My Republican friend Matt Mackowiak joined me on the show this week as co-host. I had to press him on what I regard as bad polioptics from the GOP for seeming to make undoing Obamacare into a passion play rather than simply winning elections and setting the agenda instead of railing against it. Similarly, my patience is thin for the usual video of closed National Parks and monuments as symbols of all that is wrong with the shutdown. Similarly, the ‘shock, shock’ over suspension of death benefits makes for decent network news packages, I guess, but let’s be honest: the money will be forthcoming and the Fisher House, God bless ’em, knows when to step in to fill the gap and gain our adulation. What’s really going on behind the scenes, behind the b-roll of chained fences at Yellowstone and Repatriation of Remains ceremonies at Dover AFB? While the video editors craft their packages, lawmakers are maneuvering to score victories and save face. Robert Costa, Washington Editor of the National Review, is having one of those weeks in which the nation suddenly realizes there is one guy with a better mind meld with Republican leaders than anyone else, and he joined Matt and me for a conversation. Really? Some would says there is a ticking time bomb in the form of concussions on the long term health of country’s most popular sport. Football is a sport that Matt Mackowiak and I very much enjoy (he rooting for the Steelers, me the Patriots) and Matt reminds me that in his home state of Texas, it’s best to rob a bank on a Friday night when everyone else in town — cops included — are at the high school football stadium. 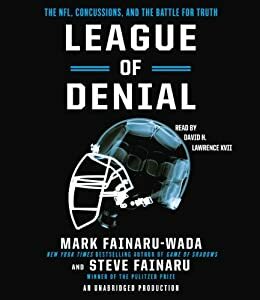 But trouble is lurking, brought to light in the new book League of Denial: The NFL, Concussions and the Battle for Truth, by Steve Fainaru and Mark Fainaru-Wada. Steve Fainaru, who writes for ESPN.com and ESPN The Magazine joined Matt and me for an extended conversation about the league, its communications strategy and the fascinating cast of characters involved in the debate. If you didn’t see the FRONTLINE documentary this week, based on the Fainaru brothers’ book and the subject of its own fascinating communications conundrum, watch it online before you watch Week 6 of the NFL, or even your own kid playing Pop Warner ball. You might not watch football the same way ever again.